Restore deleted items of OST file like: emails, calendars, contacts etc. Preview of OST data – emails, calendars, journals, tasks etc. Date based filter option for selective export of items. Export recovered OST to Office 365. There is no file size limitation to recover OST file. MS Outlook is not required to repair corrupt ost file and export it to PST. OST recovery tool tool also supports to encrypted & orphaned OST file. Supported to Windows 10 & Outlook 2016. 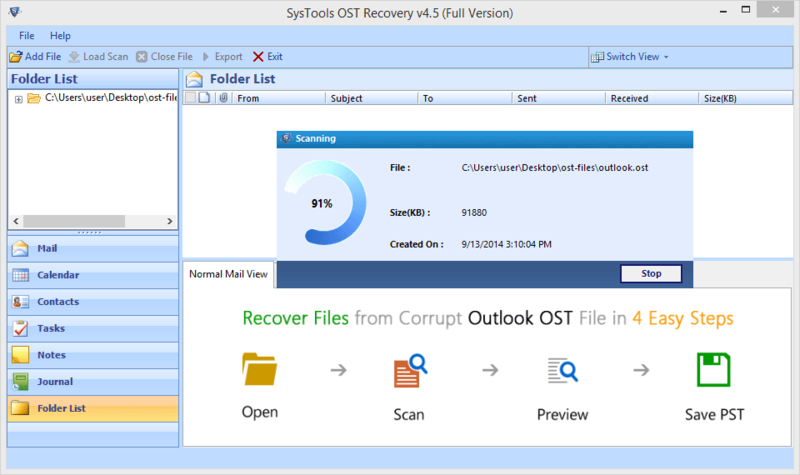 This ost deleted email recovery tool completely repair damaged outlook OST file items like emails, contacts, calendars, tasks, journals etc. There are two scanning modes in this repair ost file i.e Quick and Advance scan. By default less damaged file is recovered by quick scan method and user needs to select Advance Scan mode for the highly damaged file. After recovering deleted ost file, the software will give the preview of OST items like emails, contacts, calendars, tasks, journals etc along with its item counts. It will give the preview in Normal view with its attachments. OST Recovery software ensures to maintain the Meta Properties like sent date, received date, To, Cc, Bcc etc. As well as the meta properties of all items will remain intact. Repair OST tool allows selecting the data items files and folders to export OST to PST, EML or MSG. The software will export only the selected files or the items with only checked boxes. To repair corrupt ost file, you can apply date based filter to emails. So you will be able to extract data of selected date range. 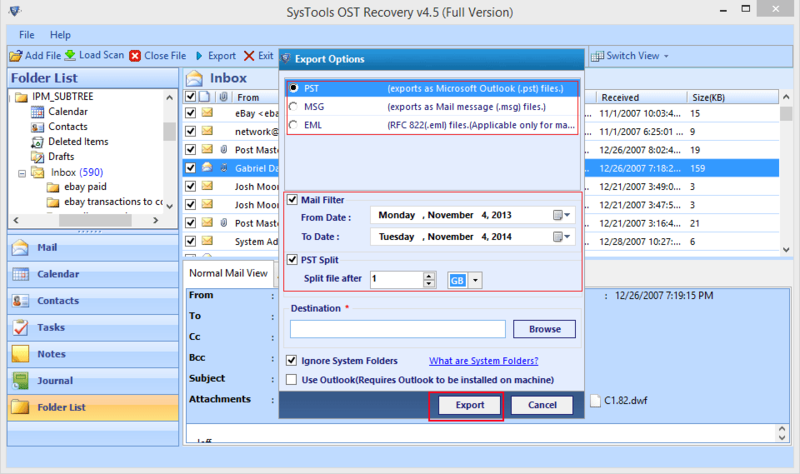 OST deleted email recovery tool gives the option to export OST file data with Outlook or without Outlook. If users have not installed MS Outlook in their system the can export data even without its installation. After repairing damaged OST file, users can extract OST data into multiple emails message format like .pst, .eml, .msg which can be accessed by its supported email clients like Outlook, Thunderbird, Windows Mail, Outlook Express etc. While saving the file into eml or msg formats, the Recover OST tool gives the different naming conventions to save the emails so that it gets easy to find any message from exported data. It can saved by its subject, subject+date, autoincrement etc. When the process of OST email recovery gets completed and the selected data gets exported, the tool generates an Export Report which contains all the details like number of items and saved location. This report can be saved in .csv format. OST file is called Offline Storage Table due to which users can work and accessed the data even when Exchange server connectivity is offline and all the changes made get synchronized whenever the Exchange comes in online mode. Power failure: During the process of synchronizing the OST files or while accessing the OST data, if the power failure occurs the files may get damaged. Virus Attack: If some malicious code or software attacks the OST data the file get infected therefore it is recommended to install an anti-virus to protect the data file. Outlook terminates abnormally: If MS Outlook is closed abnormally or forcefully shut down without saving the changes made while opening, accessing or synchronizing the OST file, it is much prone to get damaged. - Microsoft inbuilt utility repair damaged Outlook OST file only for the minor corruption issues of Offline data file. - In the case of a highly corrupted file, Intrigua Recover OST repair the Outlook Offline data file and make it accessible. 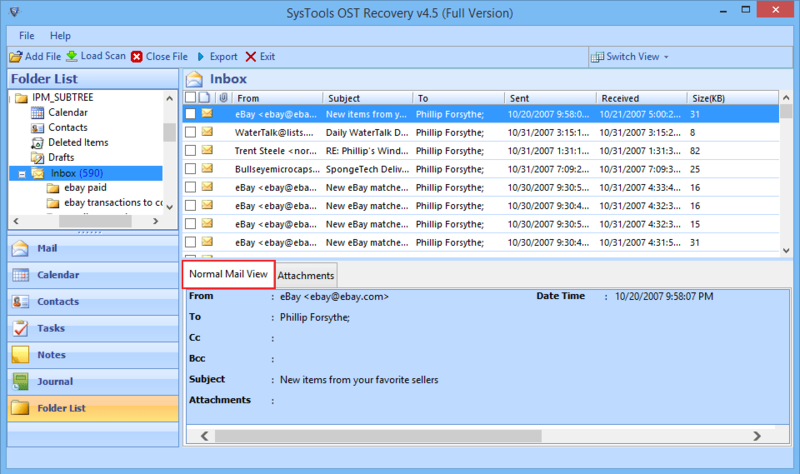 - If some OST file data gets permanently deleted, so it can be restored using the ost email recovery tool. Step 1: Launch the Software and add the desired OST file. Step 2: Scanning the added OST file. Step 3: Complete Preview of OST Items. Step 4: Export after recovering OST file into multiple formats. This video explains the complete working of MS Outlook OST repair tool to make the user easily understanding. Do I need to have MS outlook installed on my system to recover deleted data from OST file? No. MS Outlook installation for the repairing damaged OST file is optional. 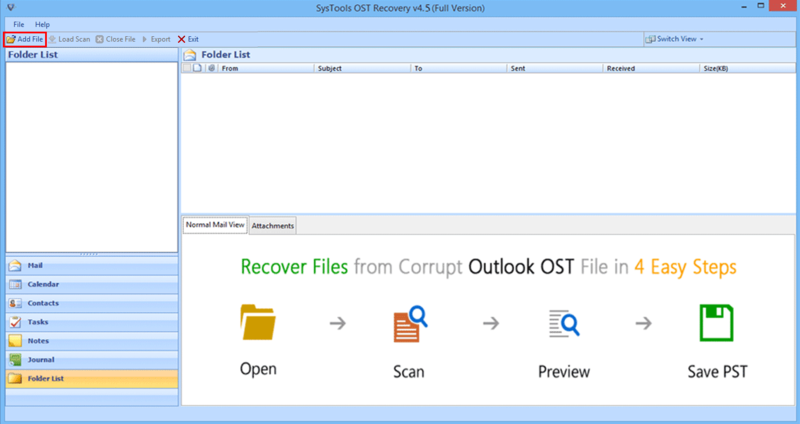 You can recover corrupt OST file even without Outlook. Can I recover OST file using this software in windows 10? Yes. OST recovery tool is a Windows based software it can be used in any versions of Windows. What is the OST file size limitation to recover deleted data from OST file? There is no limitation on file size as such, so you can use this OST Email recovery tool for OST of any size. Is this software recover deleted OST file? Yes. Using OST Recovery you can recovered all your permanently deleted emails, contacts and other data item successfully. Does this tool repair highly corrupted OST file? Yes, you can easily recover highly damaged OST file from OST email recovery tool that is not fixed by executing scanost.exe inbuilt utility. Support MS outlook version 2000, 2003, 2007, 2010, 2013 (32/64 bit- Any Version of MS Outlook). Microsoft windows are supported by Recover OST including Windows 8.1,8, 7, Vista, XP, 2008, 2005, ME, & NT (Any Version of Microsoft Windows). 25 MB of free hard disk space should be available to run repair OST tool. 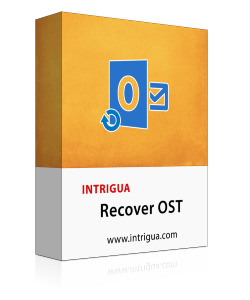 I am grateful to Intrigua Recover OST solution as it restored my all emails which get deleted accidently. I tried to found out the solution to get my data back but failed then I come to know about this amazing tool to recover deleted emails from OST file. In our business organization, we had a huge data in OST file due to some virus attack it gets corrupted and it comes inaccessible which causes many problems. In that situation, Repair OST tool helped us a lot. Now once again we can easily access corrupt & damaged data of OST file without any data loss.